Your home’s ventilation system is designed to deliver a certain amount of CFM of air to the various zones in your house. When the airflow is slowed due to the buildup of dust and debris on the evaporator coil, your HVAC system must work harder. Longer run times contribute to higher costs on your electric bill. A thorough air conditioner coil cleaning must be performed to restore proper airflow to your house. Once the coils become packed with debris, a little air conditioner coil cleaning solution can make a big difference in performance. 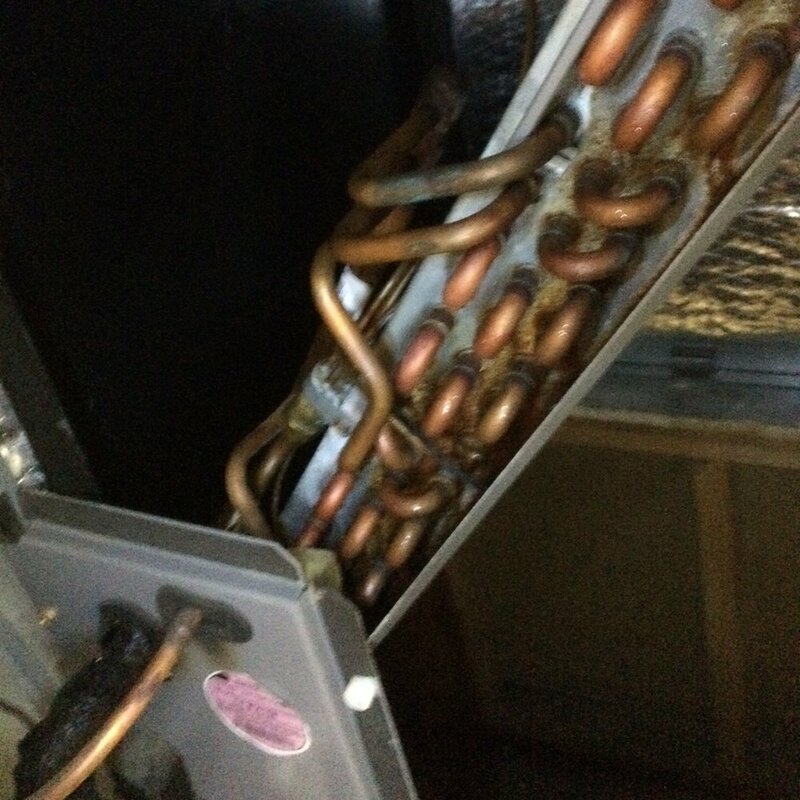 Moisture in the air hits the cold evaporator coils and condenses on them. Your AC system relies on air flow to dehumidify or remove the moisture. When the unit isn’t able to remove the water fast enough, the water can freeze and turn into ice. Ice buildup can continue to occur until a coil cleaning. The ice further reduces the air flow allowing more ice to build. The problem gets worse and may eventually stop all air flow to your house. An air conditioning system will continue to operate until it reaches the desired temperature inside your house. If the evaporator coil is blocked with dirt, the system will not be able to cool as well as it could if it were clean. The evaporator coil is responsible for removing heat from the air circulated over it and into your home. Heat transfer is reduced if the air cannot make direct contact with the coil. The only way for the A/C system to compensate is to run longer. The increase in run time will raise your operating cost and negatively affect your power bill. Air blockage in the air conditioner coil due to it being dirty will result in moisture formation on the coils and lines. Moisture and dirt are the perfect combination for mold and mildew to grow and can present a serious health risk. Sometimes there will be a musty smell inside once this starts to happen. If you suspect your evaporator coil is growing mold, call for air conditioner coil cleaning as soon as you can before the problems get worse. As your Air Conditioner operates, components like the compressor begin to build up heat. The compressor can remain in operation only so long, and once it reaches the end of the duty cycle, it may fail. Most newer air conditioners are designed to sense this rise in temperature and turn off the system before major damage happens. One of the main reasons for this situation is that the unit is in need of an air conditioner coil cleaning. Once the thermal overload circuit resets, the system goes through the same cycle. Over time this can slowly damage the compressor and other components. If it isn’t taken care of then a more expensive air conditioning repair could become necessary. Cleaning your air conditioning coils is something you can do yourself. There are many tutorials online. But, just because you can, doesn’t mean you should, or even that you should want to! If you are you looking for an air conditioning company to perform a coil cleaning service, don't delay. Give us a call! CMB Air is residential heating and cooling installation, service, and repair and company with 15+ years of experience serving Tampa and surrounding areas. If you need a new air conditioner, repair, maintenance or some other service, we can help! Call 813-461-6243 today!